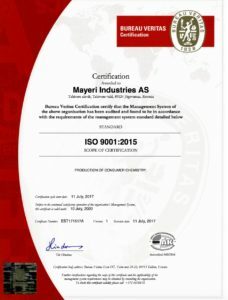 On 11 July 2017, certification organisation Bureau Veritas issued an ISO 9001:2015 quality management certificate to Mayeri Industries AS. To receive the certificate, the company had to pass an audit carried out by Bureau Veritas, in the course of which the compliance of the day-to-day activities and processes of the company with the standard was examined. Mayeri has been following and introducing the principles of quality management for years, but it was the first time that a certificate proving it was issued. The certificate signals that Mayeri’s management systems are thorough-going, well-considered, organised and documented. The company is focused on the customer, on satisfying their needs in the best way and on ensuring continuous quality. Quality management is a constant process that involves all the structural units of the company. The introduction of the management system also contributes to improving the effectiveness of business activities and the sustainability of the company. we constantly improve our quality management system. The ISO 9001 certificate helps to increase the company’s international competitiveness. It is one of the best-known international management standards that enables customers, suppliers and other interest groups make certain that the company is trustworthy and of high quality.